Radio Ballad No 3 - Parker, MacColl, Seeger, etc. Most readers of Musical Traditions will be familiar with the Radio Ballads. Spun, by Ewan MacColl, Peggy Seeger and Charles Parker, out of what ordinary people said about their own lives and feelings: their words cut and mixed together, with specially written songs, which echoed and repeated those words, and evocative musical effects, they were among the most innovative and powerful media constructs of the sixties and perhaps the most powerful radio commentaries of the entire century. They were also technically brilliant documentaries pioneering methods now standard. Topic's resissue of them is very welcome. I heard Singing the Fishing in 1960, when it was first broadcast, in less than perfect conditions on a medium wave radio with the sound fading in and out, and my impression was of a denseness of meaning barely intelligible under the circumstances - but the songs - they took on a life of their own. One of my crucial experiences was hearing Luke Kelly singing Shoals of Herring at about two in the morning outside a pub in Mullingar during the All Ireland Fleadh Cheoil of 1963. Of the songs from Singing the Fishing it's this one which has been most often assimilated into the singing tradition which inspired it. And go sailing after shoals of herrin'. I wrote this down, in the old unsystematic days, from dictation, but can't remember whose, on two bits of toilet paper (which I still have.) It tells of a minor war in the sixties or seventies between Co Down fishermen and those of the south-east coast who resented "their" waters being fished. 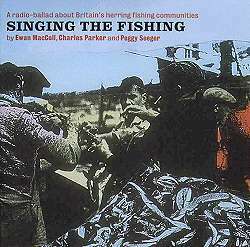 It was of course the Clancy Brothers, and not the Radio Ballad itself which brought Shoals of Herring into the consciousness of the Down coast fishermen and forces me to say that, while Singing the Fishing may be very important in the history of radio, it's a lot more difficult to resolve its relationship to musical traditions. But more of that after a while. Several of the Radio Ballads were issued, of necessity, but blessedly only slightly, abridged on LP in the late sixties (by Argo) and the copies I have are well worn. I love them and most of all I love this one. I almost know it by heart: waiting for Sam Larner's chuckle, Ronnie Balls' emphatic "brrrrr" when he talks of a netful of herring "vibrant with life", the bawdy woman-talk of the Scottish fish-gutters relaxing in the evening. Here the ordinary people are the stars and this is made clear at the outset when the announcer says "We present Sam Larner, of Winterton [and he sings "Up jumped the herring ..."] and Ronnie Balls of Yarmouth in Singing the Fishing, a tribute to the fishing communities of East Anglia and of the Moray Firth whose livelihood has been the herring" and Ronnie Balls says "If you fish for the herring, they rule your life ..." and Ewan MacColl begins with that incomparably controlled voice "With our nets and gear we're faring ..." and it continues, lines and verses interspersed with speech to tell the story - to sing the story of a way of life. This is its strength: where the words are real - where Sam Larner says "When we left school, that was sea or jail for us ...", it can't be anything but true. On the other hand a few of the songs haven't quite got the hang of the language and the little which is spoken by actors mostly jars. But this is nit-picking - it's compulsive listening, I've listened through the CD several times since it was sent and only two things really stick: one is the too obvious agenda in the juxtaposition of the profits made by fish-dealers and the dangerous life of the fisherman - "What shall it profit a fisherman to gain a catch but lose his span in the salt sea water..." (though the way it's expressed is superb) and in the same sequence MacColl demanded of some of his singers a patter style of which he was capable but they were not. I'm not happy about this because it's something which opera and the play demand of those who present them, but not 'the tradition' - there the singer is allowed to work the song, and his voice, and his way with a song, until the song's meaning reasserts itself. In the same way, Singing the Fishing is wonderful when it sets out to tell the story the people told but the compilers' perspective can intrude. It's good to find Topic rebuilding in their old image. They've done well to re-issue these important works (and they are well documented) - let's hope that this act of faith will do well for them. And, what a lovely song! : "A' the week your man's awa'" - I hadn't heard it for years and I hope that it, like Shoals of Herring, will soon gain a context independent of the Radio Ballad.